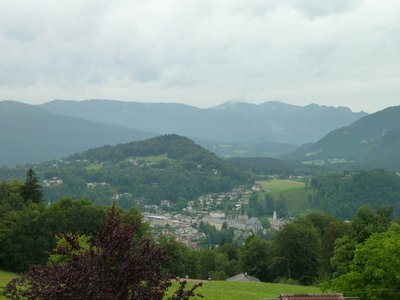 Saturday June 25 - After breakfast, we set out for Berchtesgaden, near Salzburg, Austria. 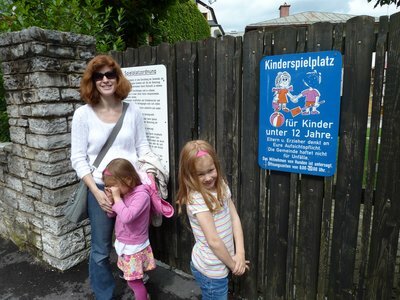 We drove for a couple of hours mostly off the Autobahn on a smaller road. 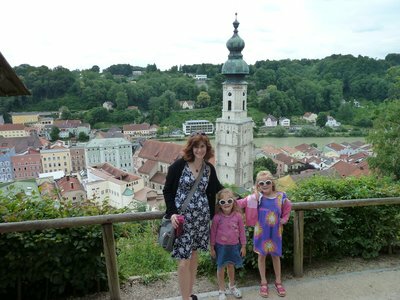 Our first stop was the longest castle complex in Europe - Burghausen. We parked at one end of the castle and walked to the other end. 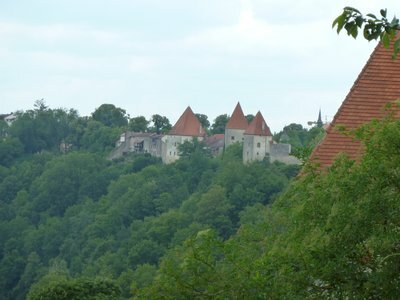 The castle stretched high along a ridge with the town below. The beginning of the complex was designed for the laborers. The middle part was for the chaplain and the main part for the dukes. We went inside the castle and climbed to the top. 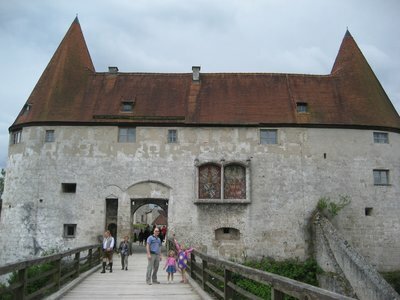 The castle was very medieval and sparcely decorated. After putting on a couple miles looking at the castle, we stopped at a random place for lunch. This turned out to be the best meal yet! 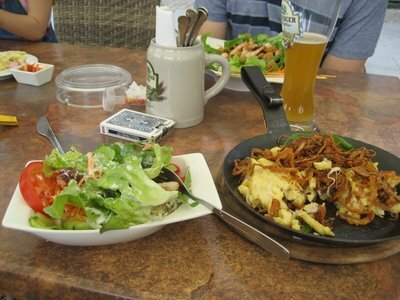 Spaetzle (dense pasta) with fried onions and cheese, salad with prawns, and weiners. 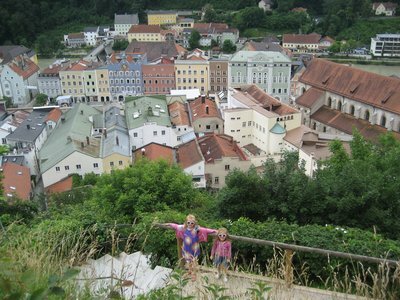 We continued driving and made our way into a bit of Austria. Diesel was cheaper in Austria so we filled up. The terrain changed greatly as we became closer to mountains that dramatically shot up from the ground. Where did these come from? We wound our way up a very narrow and steep hill as directed by the car's navigation. (Have I menioned what a fan I have become of navigation?) Finally we came upon our pension. 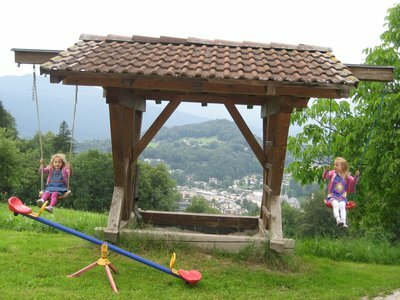 We were pleasantly surprised by the incredible view of Berchtesgaden below! Wow! The room was comfortable and had Wi-Fi. The kids enjoyed watching some of their favorite cartoons in German. We were still full from lunch so we headed to the nearest grocery store and had a little picnic in our room. 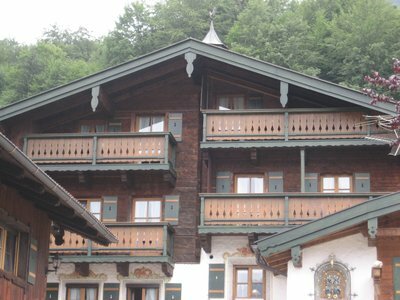 Our balcony is on the top left. 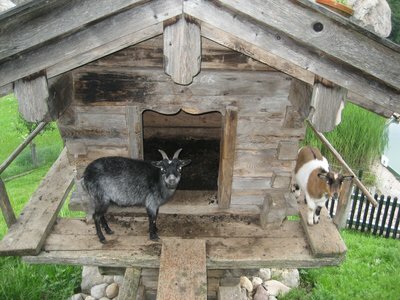 The resident goats were a big hit with the girls. The news from today will be rather brief. We had an even better breakfast this morning. What a spread! We were all excited to see a variety of cereals and milk. 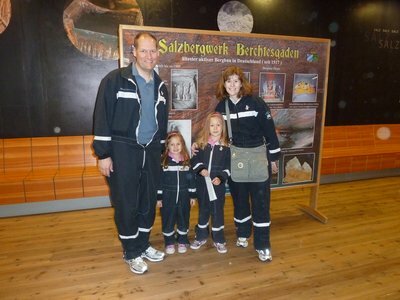 The weather took a turn for the worse so we made a plan to tour the salt mine. We got there early which was smart because the place was mobbed when we left. We all enjoyed taking a little train deep into the mine, sliding down some steep slides to lower levels, taking a boat across a salt lake, and learning a bit about salt mining. 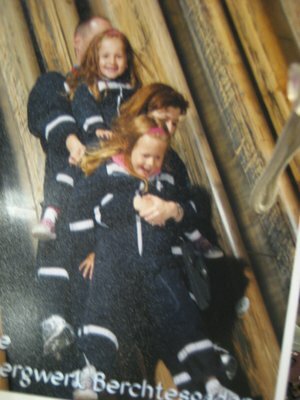 It was also fun wearing matching miner outfits! 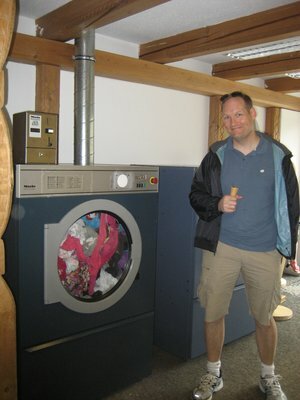 The kids were already fading fast so DH dropped me off downtown Berchtesgaden with heaps of laundry while he took the girls back to nap. It turns out that laundromats are good places to strike up conversation! 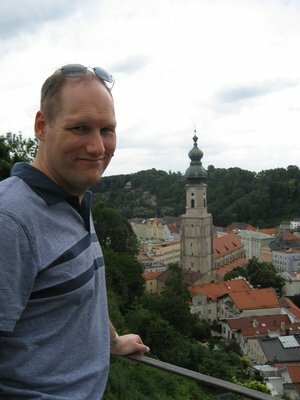 I met folks from the Czech Republic, Australia, and Germany. The machines in Germany also take INCREDIBLY long. It was nearly a three hour ordeal to complete two lousy loads of laundry. Luckily I was able to sneak a few walks around the town while waiting. 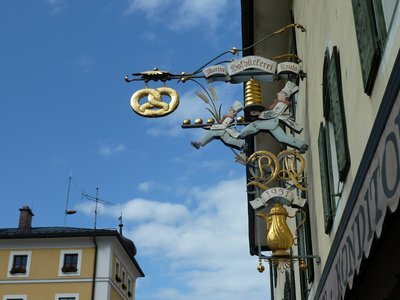 We especially liked this Martin pretzel sign. 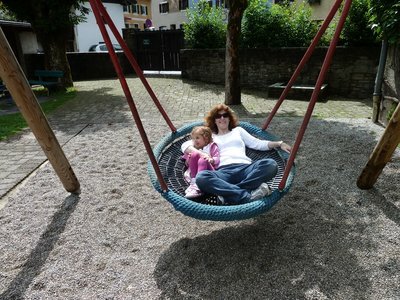 We found a nice park for the kids and ended our shorter day with pizza in the main part of town. 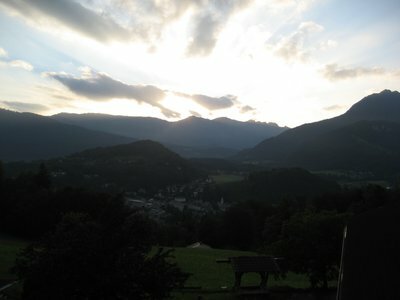 We came back early and took a short walk and enjoyed watching the sunset from our balcony. We're supposed to have much better weather tomorrow.